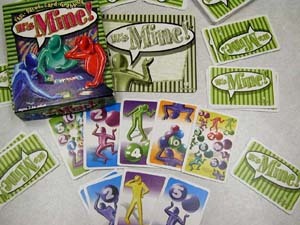 It's Mine is a card game requiring anticipation and quick hands. A dealer turns over cards one by one, and the other players around the table must decide whether to claim the set or pass. The fun is in the fact that all players except the dealer are playing simultaneously for the same set. Whoever slaps the board and yells "It's Mine" first gets the set. Reminiscent of the old kid's card game Hand's Down , the one with the great four-way, plastic slapping device, this game is part "quick-draw" and part set collecting. While the dealer is turning over cards, each player must decide whether the set is valuable. Confounding calculation, there are bad cards as well as the good. The person winning the draw must take all the cards as a set, the good and the bad. Once a person claims three piles of cards, they are out for the remainder of the round, and their score stands. The 78 cards in the deck come in five varieties. The most basic kind is worth its face value, a single number ranging from -2 to 4 points. The next kind is the "Double or Nothing" type ranging from -4 to 6 points. However, two identical cards must be collected to score the points, so a single 6 point "Double or Nothing" is worthless. Similarly, a single -4 "Double or Nothing" is safe to claim without scoring any negative points. There are also "Wild Cards" which pair with any "Double or Nothing" card to score the points. "Toast or Most" cards score ten points for the player with the most of these cards. All other players scoring nothing, that is to say their score is toasted. The final type of card is the "Jackpot" card. These cards have a nice little point schedule printed right on the card. Having one of these "Jackpot" cards scores you nothing. Two cards scores you one point, three scores you 2, all the way up to 30 points for 7 cards. Gimme, gimme, gimme! After the deck is finished or everyone has claimed their three card sets for the round, points are tallied. The first player to win two rounds wins the game. Our group found this scoring system to be a bit "do or die". That is to say, the first player to win a round threatens to end the game with their next win. Instead, we simply play 3 rounds and tally everyone's score from the three rounds. This tends to even out the play scoring and make the game length more uniform. Yelling "It's Mine" is a lot of fun. Everyone want a larger set, so there is always the tension of letting the set grow, versus the possibility that another person will grab the set. Because the sets of cards are variable sizes, there also is a real danger that one or more players may come up short in the round. This happens frequently in our group, where early table-slappers get a few big card sets, and the late table-slappers see nothing but a rapidly dimishing card deck for their turn. While we are on the subject of slapping, our game group also has done away with the It's Mine playing board. We find it too difficult to reach in the center of the table. Rather, we simply knock the table, and let the dealer resolve which player knocked the table first. Players save items to score at the end of the round. Items are acquired in sets, having both good and bad values. Each set potentially has a different value to each player. Players may only take a limited number of sets. There is danger of missing out and not getting a set. Although the It's Mine scoring, prize claiming, and artwork are streamlined, there is still very much alike in the two games. One is streamlined and compressed towards the beer and pretzels crowd, while the other is stretched toward the board game and bidding crowd. 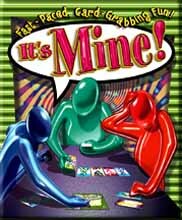 After a few games, our plays of It's Mine have become very much a psychological battle, just as it did with the old Hand's Down game when we were kids. Most everyone fakes a table-slap, or makes some other kind of audible as the dealer turns the card. The dealers too have developed styles, some taking thier time and allowing everyone to calculate a score, while others turn the cards over in quick succession, creating a furious blizzard of points and calculations. With any style, it all boils down to how fast you can knock the table. If you don't like abstract point systems or games that reward quick thinking, It's Mine is not the game for you. However, for light, fast fun, this is a great game. It is also a good introduction for new gamers, to play in between the larger games, or as a simple, fun game to play with kids. [an error occurred while processing this directive] Last modified: Thursday, 09-Jun-2011 12:36:49 MST.